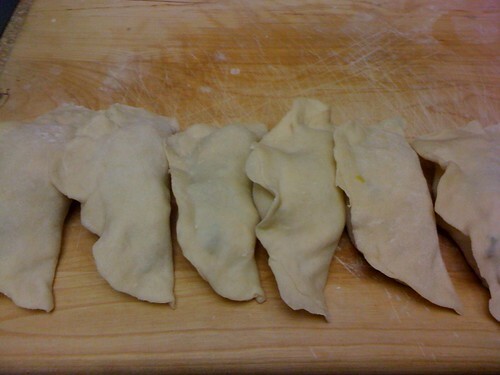 One night about a week ago, it was getting a bit late and I hadn’t figured out what I’d be making for dinner when I saw a photo a friend posted on Facebook of homemade potstickers. They looked great — the edges were crimped nicely, the dough was slightly translucent, and even though they were filled with pork, they inspired me to at least find out what it would take to make them. Searching online, a lot of recipes I found just ignored the dough and said to buy it premade, but since I wasn’t about to go out to the market, I needed to know how it was made. I finally found a site that posted a recipe, and it was inexact at best, but I tend to be inexact in the kitchen, so I decided to try it out. I started with my filling, which I had to improvise a bit to deal with the ingredients I had on hand. I settled on broccoli, tofu (which I crumbled), garlic and soy sauce. I started it going in the pan and cooked it until the broccoli was nice and green and everything smelled good. Then, to make the dough, following the recipe I found I eyeballed about the same volume of flour as the filling I had, added a little salt, then mixed in hot water until the dough felt good — not too soft and not too stiff. Then I separated the dough into small pieces and started rolling them out into circles about 4-5 inches in diameter and quite thin. When I started stuffing them, I realized they were a bit larger than the gyoza I had had before, but I couldn’t exactly go and make them any smaller at that point so I just went with it. I only had a small amount of filling left over when I was done, and I doubt I would have even had that had I not started worrying that I was going to run out and adding a bit less filling to the last few potstickers. To get th dough to stick together, I only had to pinch the edges — no egg wash or water like you’d need with the store-bought variety. And the consistency was right since they stretched well to accommodate the filling. 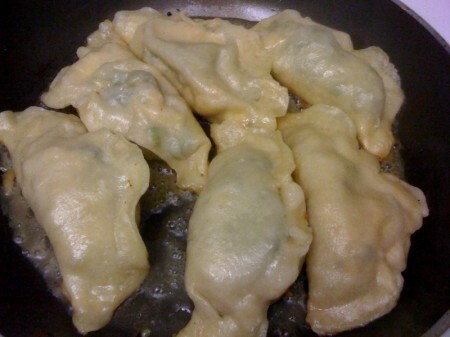 To finish cooking the gyoza, you put it in a pan with a little oil until the bottoms are browned, then fill the pan about halfway with water and cover to steam them. The first batch I did I crowded a little too much and a few stuck together, but the second batch turned out better. They did look like the real thing, they tasted fresh, and I liked my filling choice. It also didn’t take as long as I thought it might — about an hour start to finish. I read that you could also freeze them before the final cooking steps and just cook them later. I’d love to experiment with other fillings and work on getting the size just right, but I think my little evening experiment went quite well for a first try with very little to go on as far as a recipe.